When I go through a season of suffering or crisis, I am rarely able to write about it during or immediately afterward. It takes my soul and mind time to sift through it, to see what heals and how, what rises and what settles. And writing takes energy that is in short supply at such times. The last two months have been such a season for me and my family. I am depleted and still somewhat traumatized by walking my daughter through an injury that developed into a complex, frighteningly intense pain condition. After many emergency room trips and visits to bewildered doctors, she is finally being treated for several weeks at an inpatient pain rehabilitation program, which will be followed by several weeks of all-day outpatient rehab. Her journey out of pain and disability is a long road yet. It is not a given that she will fully recover, though our hopes are high for complete remission. It’s still too close for me to write about with any clarity. Even the sentences I just wrote are woefully inadequate to describe what this experience has been like for us. The following poem by Rilke speaks for me, to my daughter. It speaks in short gasps, phrases that can be uttered in an exhalation. The mood is dreamlike—how I feel walking through a day utterly weary in body and soul, unable to speak to others much at all, suffering with my daughter whether I’m next to her or apart from her, sinking into the blessed exhaustion of sleep. “I grieved so much. I saw you pale and fearing. That was in dream. And your soul rang. and both souls sang themselves: I suffered. It helps to borrow someone else’s words right now. Until I find my own. Any writing I’ve managed these last two months has been a cathartic hybrid of journaling, prayer, and free-writing. Whether or not something “polished” eventually comes from it all remains to be seen. 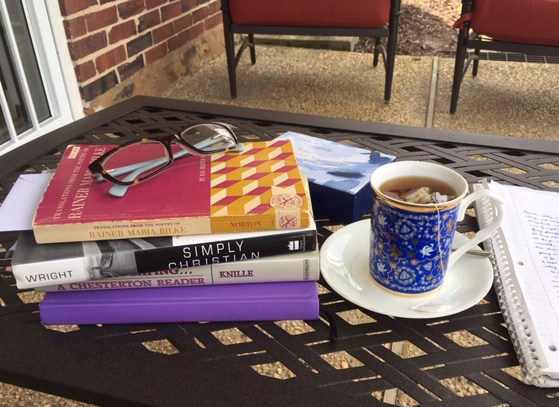 In the meantime, I’m doing restorative practices as often as I can: sitting outside in the warming spring air, taking walks, drinking tea, reading, praying, and sitting in silence with God. God is in the midst. He will never leave or forsake you. You (collectively) will be provided with what you need ad exactly the right time. Still lifting you all up to the Most High.